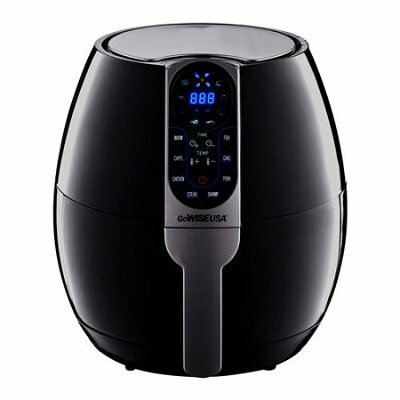 There’s nothing like a big price savings to stop one in their tracks and that’s the biggest reason I uncovered in my GoWise USA 8-in-1 air fryer review that consumers have for looking at this model over the more popular Philips product. There’s a hefty difference and before you decide between the two you’ll want to understand what features – if any – you’d lose in exchange for buying the cheaper air fryer. After all, air fryers use the same hot air technology to cook food. 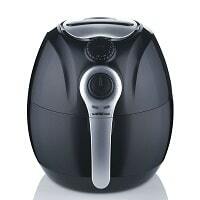 The first Gowise air fryer to hit the market was the 8-in-1 GW22611 digital model. 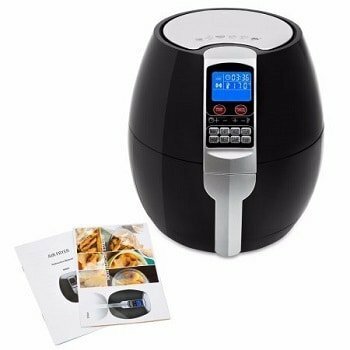 1.7 What To Cook In The GoWise Electric Air Fryer? This Gowise 3.7 qts 8-in-1 (1400 watts) comes in 4 color choices. Electric air fryers use the hot air technology to cook food instead of hot oil as is normal in the traditional deep fryers. 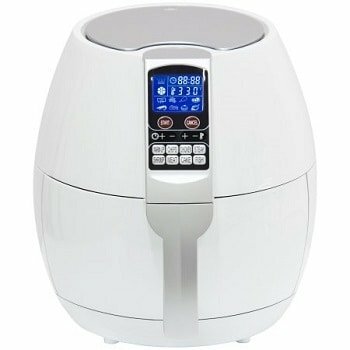 The GoWise USA electric air fryer makes use of Rapid Air Circulation System whereby heated air circulates at high speed cooking the food in all directions. A fan helps to blow the hot air all around the food thus ensuring even cooking. Both the heating coil and fan are located in the top part of the air fryer. Gowise has the digital 3.7 qts 4th generation digital air fryer with touch screen technology. There are 3 models of the GoWise hot air fryers in the market (at time of writing), the 3.7 qt 8-in-1 air fryer GW22611 (newer 5th generation model GW22638), the 2nd generation 3.7 quart capacity electric air fryer with manual knobs as well as the 2nd generation 2.75 qt digital air fryer and the 4th generation 3.7qt digital air fryer. Their 4th generation digital air fryer is also available in XL 5.8 qt capacity. The initial first released GoWise air fryer comes with 8 preset cooking programs, the 2nd generation air fryer has no preset programs and the 4th generation digital fryer comes with 7 preset programs. Check out the differences between these different sizes GoWise low fat air fryers written further down this review article. 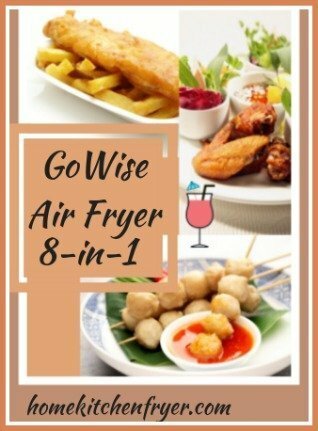 Yes, the GoWise USA 8-in-1 air fryer offers a different way to fry your French fries, fried chicken or your pork chops. 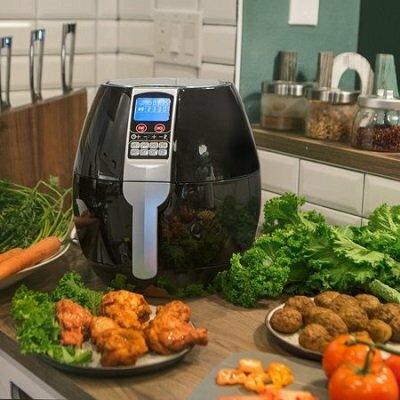 Is it really a ‘no oil air fryer’? Is it really a healthy air fryer? Well, it is not exactly a greaseless air fryer. The GoWise airfryer, just like the Philips airfryer or the Tefal Actifry, cooks best with about a tablespoon of oil added. With the additional 1 tbsp oil, you get a better crisp and more even browning of the food. The precooked frozen food cooks best without any extra oil added. This low fat air fryer does offer a healthier way to cook your food instead of deep frying them in oil. One tablespoon of oil compared to the 2 – 4 liters of a deep fryer – that’s a lot of difference, right? The hot air deep fryer offers you a good way to cut down on fat and calories but still get to indulge in your favorite fried food. However, the real test would be in the taste and texture of the cooked food. Does it really taste as good as fried food? After going through lots of GoWise air fryer reviews online, the verdict seems to be good. There were comments such as tasty homemade French fries, fish and chips and fried chicken etc. up to expectations. Yes, this is one home hot air fryer that is affordable and produces satisfying results. The GoWise electric air fryer (GW22638) comes with a 3.7 quarts cooking capacity. Well, how much is 3.7 quarts? You can cook 4 portions of French fries in the 3.7 quarts cooking basket, 3 – 4 chicken drumsticks, 4 – 5 chicken wings or about 2 pieces of pork chops. It is about the same size as the XL Philips airfryer. However, this Gowise USA electric air fryer comes with only 1 layer of cooking (the cooking basket), unlike the Philips digital air fryer with its wire rack insert that let you separate foods and do two layers at the same time. For larger families or if you entertain a lot, then you’ll need to cook in batches, get a second air fryer or getting the larger capacity 5.8 qt Gowise air fryer. Their biggest size air fryer oven comes with a 12.7 qts cooking capacity. The GW22638 comes with 8 precooking settings, namely warm, fries/chips, chicken, steak, shrimp, pork, cake, and fish. Just press the button for the setting you require, this feature removes the need to set your temperature and time manually. If you do not wish to use the preset feature, it does come with manual option for setting temperature and timer. You can set the temperature to between 170°F – 400°F. The temperature is displayed on the screen. This temperature range is good and matches that of competing models. The range you can set on an air fryer defines the kinds of foods you can cook inside. This gives you full flexibility. It comes with an indicator that lets you know when temperature is reached. You can set the timer to a maximum of 30 minutes. This is sufficient for most kinds of foods. Because of the basket capacity you’ll only be doing a serving or two so you don’t have to cook very long however, an air fryer does take longer than it takes to deep fry the same food. What To Cook In The GoWise Electric Air Fryer? You can fry, grill, roast or bake in your GoWise airfryer. You can even bake a cake. You will need a cake pan for this and GoWise USA has come out with the cake pan accessory. For French fries, the maximum recommended amount is 17.5 oz. The diameter of the cooking basket is 8.5″. However, there are other brands air fryer accessories that you can use as long as these fit into your cooking basket. It is approximately 6.5″ x 3″ and has a non stick surface that means cleaning is easy. It also has a handle for easy handling. If you have your own similar size cake pan, you can also use it to start baking your cake in the air fryer. However, those cake pans meant for the oven would not have the convenience of the handle for hassle-free handling. You can also cook any recipes with liquid base using the cake pan such as curries or stews. 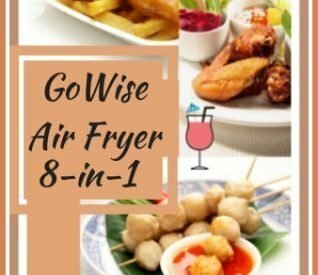 You might want to check out other brands air fryer accessories that are compatible with GoWise air fryers. There are lots of foodstuff you can cook in the hot air fryer. 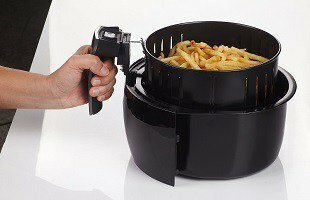 Fried chicken wings, fish and chips, Tater tots, frozen food, meat patties and of course the ubiquitous French fries turn out great when cooked in this GoWise low fat hot air fryer. You can also grilled cheese sandwiches for breakfast – fast and with minimum cleaning is great when rushing to work. Shaking the food halfway through cooking time will ensure more even cooking. The preset cooking modes take the guesswork out of adjusting the temperature and timer for some of your recipes. As with other air fryers in the market, a bit of testing with variations in temperature and time will get you the result that best suits your taste. Click the ‘check price’ button below to get the Gowise 8-in-1 (GW22638) 3.7 qt air fryer in black or white. A recipe book is included. The GoWise hot air fryer is fitted with a stay cool handle which doesn’t heat up during the cooking process. It also has automatic switch and automatic standby mode. The air frying machine automatically switches off once the timer reaches zero and cooking is completed. There is no danger of overcooking. It will also automatically switches off when the basket is detached or removed from the drawer. It has a guard button that keeps the cooking basket safely attached to the fryer. You need to slide this guard button upwards to reveal the release button. Press this release button for the basket to detach from the pan. The GoWISE USA Air Fryer is ETL certified and complies with all standards regarding Electro-Magnetic fields. The ETL Mark is proof of product compliance to North American safety standards. The removable iron metal cooking basket with the Calphalon non-stick coating and drip tray or basket holder are dishwasher safe and are easy to clean even by hand. Soaking in hot water immediately after cooking helps in easier cleaning later. Removable drip pan and detachable metal cooking basket (8″ x 8″ x 3″). 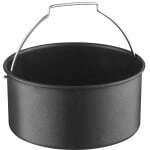 Both the cooking basket and drip pan are made of iron with a non-stick surface coating. It looks like you might find it easy to shake the food in the basket due to its solid side walls. Food should cook fast and more evenly in the mesh bottom basket due to good air circulation. Remember, the heated air needs to hit the food from all angles. You can release the basket from the pan by pressing a button located on the stay-cool handle. Both are dishwasher safe. You have the option to buy the GoWise baking pan with handle for more cooking options especially liquid and semi liquid food. There are 3 models of 3.7 qts GoWise air fryers for the US market at the moment. You can opt for the 3.7 quarts model with its 8 preset modes, the 3.7 quarts 2nd generation manual model (older model GW22622, newer model GW22822) or the 4th generation 3.7 quarts digital Gowise air fryer with 7 preset cooking modes (GW22621). All 3 models use 1500 watts. All 3 have solid black coated metal cooking basket with vertical slits at the side (certain sections) and round holes all over the bottom part. So what are the differences between these 3 models? All 3 air fryers have adjustable controls for temperature and time. The 8-in-1 fryer has digital controls, 2nd generation model has manual dials and 4th generation has touch screen digital interface. The 8-in-1 fryer also comes with 8 preset cooking modes which are not included in the 2nd generation fryer. The 4th generation model has 7 preset programs. The 2nd generation manual model is only available in black at this moment. The 8-in-1 fryer comes with the most color choices – black, white, red, plum. 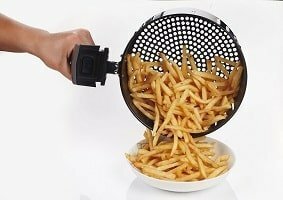 As for the larger fryer, you have a choice of black or white. Both can cook more or less about the same amount of food at any one time. Both come in black (GW22612) or white (GW22611). Update: You can now get the 8-in-1 in red too. Maximum temperature is about the same too at 390 degrees for Philips and 400 degrees for GoWise. Both come with a non-stick cooking basket with solid walls and mesh bottom as well as drip pan to collect excess oil. The GoWise 8-in-1 air fryer has 2 setting options; a choice of manual selection of temperature and time as well as 8 preset cooking modes. As for the Philips airfryer, you can set the temperature and time by turning the dials, it does not have any preset cooking feature. 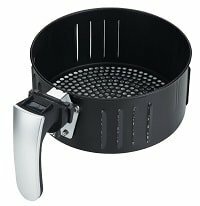 There are a few choices of Philips air fryer accessories to increase the cooking potential of the Philips air fryer whereas the GoWise low fat fryer only has the cake pan with handle accessory. Gowise fryer is cheaper compared to its Philips counterpart. So, which of these differences are important to you? The end results – the cooked food – would be the same. The major benefits of this hot air fryer is much less grease in your food, less work involved in the cooking process and fast cooking. If these 3 main benefits are important to you, then the airfryer will appeal to you. You can reheat leftover food using the air fryer and food tastes just like freshly cooked. Reheated pizza tastes just like those fresh out of the oven. Saves wastage of food which might otherwise be thrown away. You can cook a wide variety of foodstuff in the hot air fryer. Hassle-free cooking is possible with the hot air multi cooker. Yes, it does make cooking less tedious. 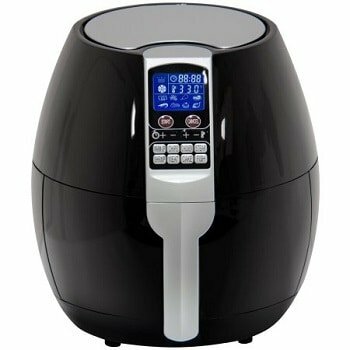 Cost Effective Airfryer : If cost is an important factor to consider, then the GoWise air fryer will also appeal to you. It is the cheaper air fryer compared to Philips air fryer (manual dials) that also uses rapidly moving heated air to cook the food. The differences between the two come down to the number of additional manufacturer accessories available for one vs the other, the preset options, and the annoying but manageable fact that you’ll have to reset the time and temperature any time you stop to shake the food in the middle of the cooking process. 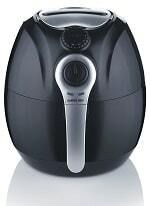 Other than that, the cheaper GoWise air fryer has all the features of the more expensive Philips model. An air fryer is truly great if you wish for fried food with less fat. The black and white model both come with a choice of 2 different button designs.